Full-service mold specialist K&K, Inc., has thrived throughout 20 years of business by making time-saving technologies central to its daily practices. Vero has provided one of those technologies -- software that has optimized the CAD/CAM process. Diverse in its capabilities, HED//Mold Specialist K&K, Inc., serves a laundry list of customers from various industries, including automotive, medical, packaging, casting, heavy truck, material handling, and product-design. K&K also offers engineering services, providing an additional layer of flexibility to customers who aren't sure how best to get from art to part. K&K, Inc., uses WorkNC automatic hole machining, which works in conjunction with feature recognition to automatically identify hole geometry. "We're full service and do our best to fulfill all of the needs of our customers, from design all the way to testing the parts," says George Riem, CNC programmer for K&K, Inc. "A lot of the companies we serve have engineering teams that only have an idea of what they want, and we pick it up from there. In other cases, it's just a part file and our designers will build a mold around that." K&K uses whatever type of material the job requires to turn out its patterns, coreboxes, vacuum forming tools, and custom fixtures. While those materials include standard metals like steel and aluminum, K&K also works in plastics, such as "red board," and even wood. "We go that extra mile for the customer, and that is something that tends to set us apart from other shops. It keeps our customers coming back," adds Riem. The company combines the benefits of feature recognition and automatic hole machining with the WorkNC Machining Strategy tool, a function that allows programmers to save files with data that can be applied again and again to specific operations. To program its CNC machinery, K&K has used the WorkNC computer-aided-manufacturing (CAM) solution, by Vero Software, to machine in up to three axes since the company's inception in 1997. "There's no such thing as a smooth job because you never have enough time or even all of the information that you'll need, so you use the expertise that you have to begin the job even if you don't know everything that's coming," Riem says. "We've taken a lot of the human error out of our jobs by allowing WorkNC to do as much as it can for us. As long as the design is correct and complete, we are machining directly to the data -- and that is a huge time saver because fewer mistakes happen." To handle its design duties, K&K generates design files in the SOLIDWORKS® CAD solution, by Dassault Systèmes, and imports those files into WorkNC. The software's direct translators are continuously developed to provide an optimum level of performance and reliability in opening native CAD files. When WorkNC identifies a tapped hole, Riem uses a saved Machining Strategy file that tells the system how he wants the hole tapped. Reusing preferred strategies eliminates the need to tell the software "over and over again how I want to perform the job," Riem says. "One of the main reasons that I like the feature recognition and automatic hole machining is that they sort all of the information out for me," says Riem, who often works on jobs that require the machining of hundreds of holes of varied diameters and depths. "For just one part, there could be holes with 200 different depths, and the software sorts that and divides that up for me in just a couple of minutes." 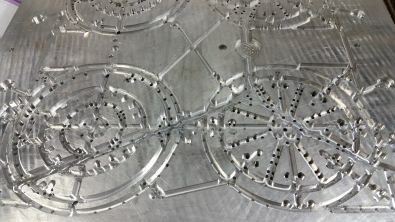 Without WorkNC, Riem would have to machine all holes of a specific depth, then return to the software to program holes of a different depth -- returning again and again until all holes of various depths are machined. For even further automation and standardization, the company combines WorkNC's feature recognition and automatic hole machining capabilities with its Machining Strategy tool, which allow programmers to save files with data that can be applied again and again to specific operations. 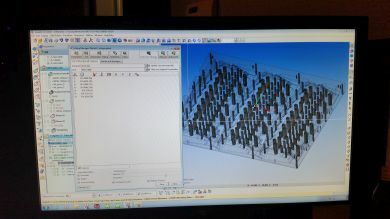 "For instance, when automatic hole machining software sees a tapped hole, I have a saved Machining Strategy file that is going to tell it how I want it tapped," Riem says. "The Machining Strategy saves me from telling the software over and over again how I want to perform the job." "For example, aluminum and hardened steel are not approached the same way, so there would be a different strategy for hardened steel to make sure the hole is perfectly straight before it's reamed," Riem says, describing one method for creating strategies. Additional standardization is available in the form of WorkNC Machining Sequences, a tool that expands upon the concept of saving and reusing vital data for similar jobs. K&K is able to reapply the automatically-saved process data, as WorkNC keeps records on toolpath, holder collision checks, tolerances, cutting tools, and more. 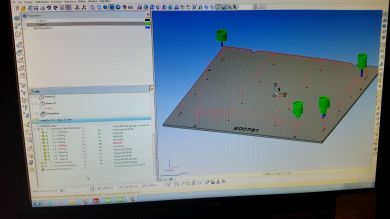 Machining Sequences saved as collections of predefined toolpath parameters can be applied to new geometry within specified work zones. A programmer may, for instance, designate sequences for roughing, semi-finishing and finishing, all of which can include speeds, feeds, step downs, stepovers, and tooling information. 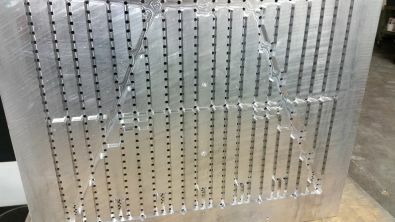 "For my sequences, I may have a roughing toolpath with a specified cutter and the next step is the finishing toolpath with another tool, and so on," Riem says, explaining K&K's use of Machining Sequences. "You can save that sequence and call it whatever you want -- like 'George's favorite toolpath' -- pick it out of the sequence area and migrate it into the work zone so that you don't have to rewrite all of it." 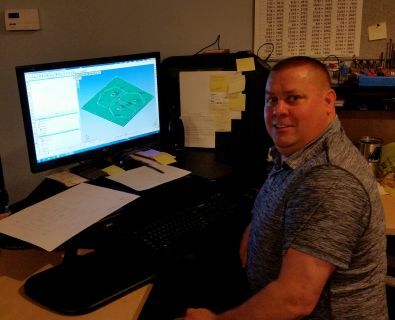 "We go that extra mile for the customer, and that is something that tends to set us apart from other shops," says CNC Programmer George Riem, shown programming at K&K, Inc., of Elkhart, Indiana. While Riem takes advantage of several specialized toolpaths in WorkNC, including Z-level roughing for quickly removing large amounts of material, he says that the software's Undercut Re-machining capability is especially valuable to K&K. "Undercut re-machining allows you to use T-type cutter or a lollypop cutter so that, if you have an overhanging feature from vertical or from the top looking down, you can get to it. That cutter can cut beneath that ledge but not have any collision at the point that it tries to retract. The undercut re-machining looks for that and allows you to use that kind of cutter to safely cut those areas." "I don't think there's anything being made today that couldn't have been made in the 80's, but they used to take a lot longer to make," he says. "It's really all about time savings and being able to be competitive -- and now and it takes six weeks to make a mold instead of six months."